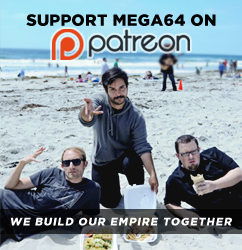 MEGA64 KICKS OFF AN ACTION-PACKED SUMMER!! So many great people (and special guests) put their all into this extra-long vid and we hope you enjoy it. Share it with whoever you can! But we're not just kicking summer off with a rad new video- we're also about to descend onto the summer conventions! Two of the biggest events we do every year- Anime Expo and San Diego Comic Con- are just around the corner! Let's take a quick look at what we'll be doing at both those awesome events! At Anime Expo, we'll be having our panel "Mega64 Filler Recap Bathhouse Episode Panel At the Beach" on Thursday, July 5th at 8:30PM in Room LP1! This is one of our craziest panels every year, and this year will be no exception. We'll be showing some fun stuff new and old! Then at San Diego Comic Con, we'll be throwing our "Mega64 Ultimate Multi-Billion Dollar Cross-Franchise Teamup Panel" on Friday, July 20th at 8Pm in Room 25ABC! This is our hometown show so we always make sure to pull out all the stops. Don't miss it! So what new items and exclusives will be at our booth at both cons? Well let's look! First of all, you can believe we'll have ALL our hottest items past and present in full stock! But as for new items and exclusives... behold some of the awesome new stuff we're bringing with us! We'll have an exclusive poster for San Diego Comic Con too, but we'll reveal that at a later date. Be sure to visit our booth as soon as you can- a lot of this stuff is likely to run out. But even if you don't want to pick up anything, you can always come by our booth just to say hello and meet the gang! We'd love to see you all there! Stay tuned for more fun stuff with Mega64!